Japanese Tea Story : Go Out Hunting with Tea !? “Konkatsu” is popular (in a way!?) here in Japan. That is, “marriage hunting”. Unmarried people attend the a “konkatsu” party or an event in order to find a future better-half. 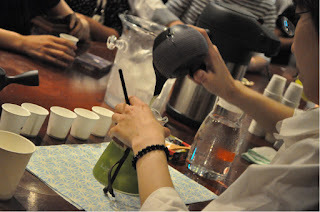 A tea company, CHA-ICHI WORKS, held “konkatsu” tea event in Tokyo. It was the seventh time and it seems to be a success all the time. Attendees, who meet there for the first time, work together to test Japanese tea by tasting and guess which is which. When they answer all the questions correctly, they can leave the site together if they like. Although it is the first time meeting for them, its relaxing and enjoyable atmosphere seemed to help feel more at ease about speaking to and enliven their conversation. While learning about Japanese tea, they could find a spouse-to-be. I know that tea often brings synchronicity. So I believe that it can happen. Don’t you think?